Files with ext file extension may also be found as old extensions for Norton Commander file manager for MS-DOS operating system. What is ext file? How to open ext files? The ext file extension is or rather was mainly associated with the Norton Commander file managing program for MS-DOS, later also released for Windows and OS/2. The ext file stores extension that adds new features to Norton Commander. This ext file type entry was marked as obsolete and no longer supported file format. 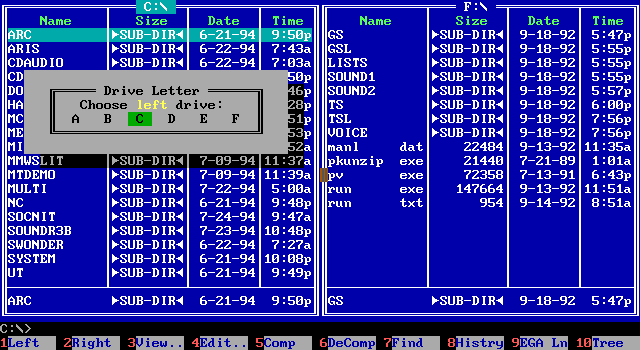 Norton Commander is a legendary file manager for MS-DOS. It was quickly abandoned when Windows 95 hit the market. You can import this type of .ext files to old Norton COmmander. You cannot convert this file type to anything else and quite frankly, there is no reason to do so anyway. and possible program actions that can be done with the file: like open ext file, edit ext file, convert ext file, view ext file, play ext file etc. (if exist software for corresponding action in File-Extensions.org's database). Click on the software link for more information about Norton Commander. Norton Commander uses ext file type for its internal purposes and/or also by different way than common edit or open file actions (eg. to install/execute/support an application itself, to store application or user data, configure program etc. ).